When I was in Grad school, I had plans to write what was going to be a ground breaking thesis and political adaptation of Richard III. Sounds exciting, right? (...only theatre nerds slowly nod head yes). However, I was completely immobilized by grief and attending counseling one to two times a week. Luckily, my Graduate Advisor allowed me the creative thesis route: to write a play. Mind you, I'd never taken any playwriting classes and certainly never written a play before. I'll be speaking more on this in a later post, but I'm jumping to the end of this anecdote. I called my mom and told her, "I don't know how to start this play." "With grace," she said. And I did. The first words spoken in my play are by the character of Grace. You guys, Grace is my FAVORITE celebrity and she's actually in Los Angeles this weekend!! She's been sighted in several LA hotspots and I hear she's even more beautiful in pictures! If that's even possible!! She was greeted in LA by her fans and some paparazzi, waving to the crowd and signing a few autographs. I love her style, her smile brightens up a room, and she seems so fun! Wish I could meet her! Have a great weekend in L.A., Celebrity Grace, you are seriously the coolest. You can still be part of Grace's celebrity Wish! In under five minutes, make a little sign showing Grace some love and share it on instagram with the hashtag #CelebrityGrace so she can see and #TeamITLT so WE can see it! It's adorable how she's been keeping up with photos, commenting, and re-sharing pictures. Just a few minutes might make this little lady's weekend even more special. Here's ours! The official Make A Wish "Sign ups" are closed, but if you're in Los Angeles you can see below for Grace's next destinations. Follow her on IG: @CelebrityGrace and check out the photos from her celebrity-filled weekend! 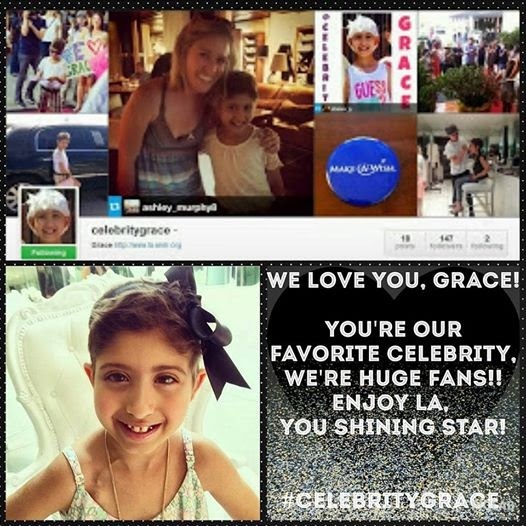 You can also follow @wishlosangeles and #CelebrityGrace for live tweets!